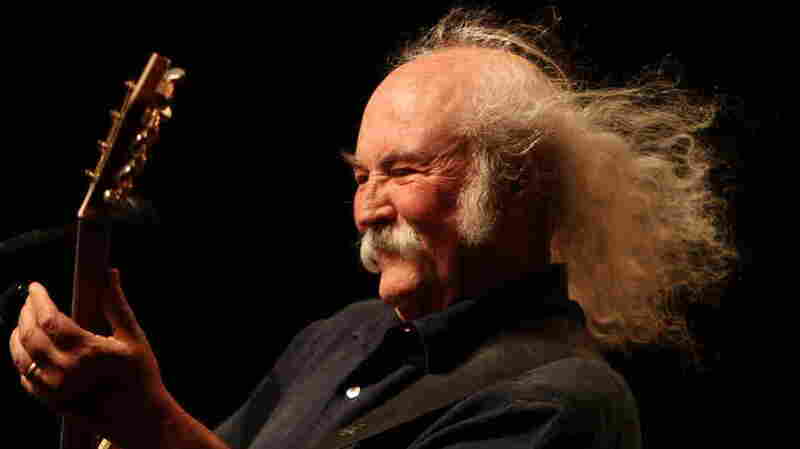 David Crosby On World Cafe : World Cafe David Crosby has had such a wild life, we're thankful that he is still with us — and turning out work as good and relevant as his fourth solo album, Croz. As a member of The Byrds and Crosby, Stills, Nash & Young our guest today, David Crosby, is one of folk-rock's superstars. He has made four solo albums, worked with his partner Graham Nash, produced Joni Mitchell, and formed a band with his son James Raymond. He's had such a wild life, we're thankful that he is still with us — and turning out work as good and relevant as his fourth solo album, Croz. His first solo album, 1971's If I Could Only Remember My Name, was a personally harrowing experience recorded in the aftermath of the death of his girlfriend Christine Hinton in a car crash. His drug excesses are legendary. His recovery after receiving a liver transplant is just as astonishing. Crosby and his band, including Raymond, will play live and we will talk about what is still most important to him — the music. This session was originally published on May 2, 2014.